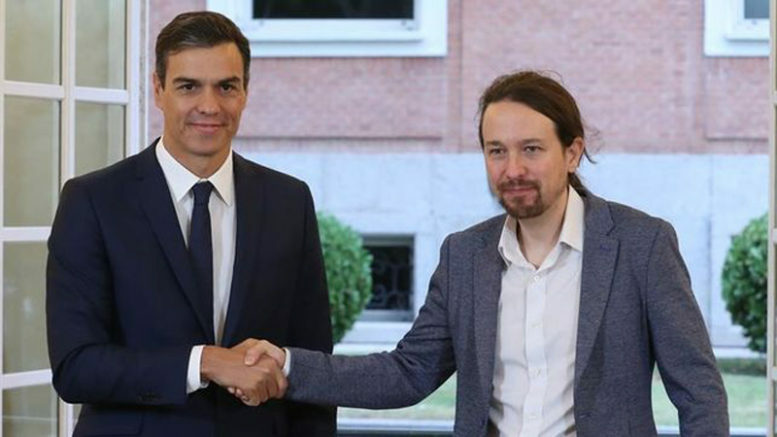 President Pedro Sánchez of the Spanish Socialist party (PSOE) and Podemos General Secretary Pablo Iglesias signed an accord Thursday for increased social spending and new taxes on businesses and Spain’s wealthiest citizens as part of the government’s 2019 federal budget proposal, which Sánchez is to take to the European Commission in Brussels next week with an eye to securing crucial EU approval. The budget proposal agreed Thursday includes an increase in the minimum wage for Spanish workers, greater protection for renters and regulation of the rental housing market to ensure more affordable housing, reduction of utility bills for homeowners and measures aimed to move Spain toward a more environmentally sustainable economy. It also includes reforms to Spain’s national electoral law and an end to antiquated laws prohibiting strike action by labour unions. Some of the anticipated social spending in the budget would be financed by a new 1 percent annual tax on the fortunes of individuals and families that are in excess of 10 million euros. The PSOE-Podemos proposal is still far from approval by Spain’s Congress and could well remain a showcase budget, simply demonstrating that a left-wing government in Spain can gain EU approval of significant increases social spending, following years of austerity budgets under the conservative Partido Popular (PP) government under former President Mariano Rajoy. That’s because once EU approval is secured as expected through the efforts of Spanish Economy Minister Nadia Calviño, formerly director general of the European Commission’s budget department, it must still be approved by the slim majority of votes cobbled together among Spain’s political left and regional nationalist parties that brought Sanchez to power in a no-confidence vote against Rajoy in June. Already the PP and centre-right Ciudadanos party are criticizing the PSOE-Podemos accord, with PP spokesman Ignacio Cosidó in Spain’s Senate relying on “red scare” tactics, saying that having Podemos anywhere near management of the economy will mean that Spaniards “will be suffering from hunger in a few years, just like in Venezuela”. Of greater concern for the Sánchez government, however, is the frail coalition that brought him to power, with the centre-right regional Partido Nacionalista Vasco (PNV) and Partit Demòcrata Europeu Català (PDeCAT, Catalan European Democratic Party) unlikely to warm to tax increases that would negatively impact their regional business power base. At the same time, congressional spokesman Joan Tardà of Esquerra Republicana de Catalunya (ERC, Republican Left of Catalonia) made it very clear this week that as much as his party might favor a budget with a pronounced social agenda, it intends to vote against the PSOE-Podemos budget unless the Sánchez government agrees to pressure prosecutors to release Catalan politicians from preventive detention while awaiting trial on charges related to last year’s illegal independence referendum for Catalonia.